A well-organized development process allowed us to deliver solution step by step. Our first contribution to this project was attractive and functional design. In order to satisfy all client’s demands after detailed investigation and architecture planning we decided to use Django Oscar. This open-source e-commerce solution is simple yet flexible, feature rich and easy to customize. Security of Python and Django-based technology, extensible core and well-designed set of models assist with implementing e-commerce project tailored for this particular client. According to the technical specifications our client wanted to have several websites managed by one back-office. On the basis of Django Oscar we developed multi-tenant solution. Back-office allows managing products, stock, prices, sales, suppliers, customers, etc. for several websites - all in one place. Administrator can control content of all online stores without unnecessary repetition, assign different prices for the same product in different e-shops, manage stock and supply records. Customers can use one user account for all websites with separated baskets and wish lists. One of the main project requirements was development of the “offline order” app, that allows admin pharmacist to create order from the Dashboard. Offline order still requires internet access, but can be conducted without direct involvement of a customer. This functionality was implemented to be applied in the offline pharmacy, specifically when customers send their requests via phone, email, or fax. Also offline order feature can be used when customer orders products at the pharmacy but there is time difference between the order itself, payment and delivery. Offline order steps replicate the online checkout process, specifying channel via which order had been received. 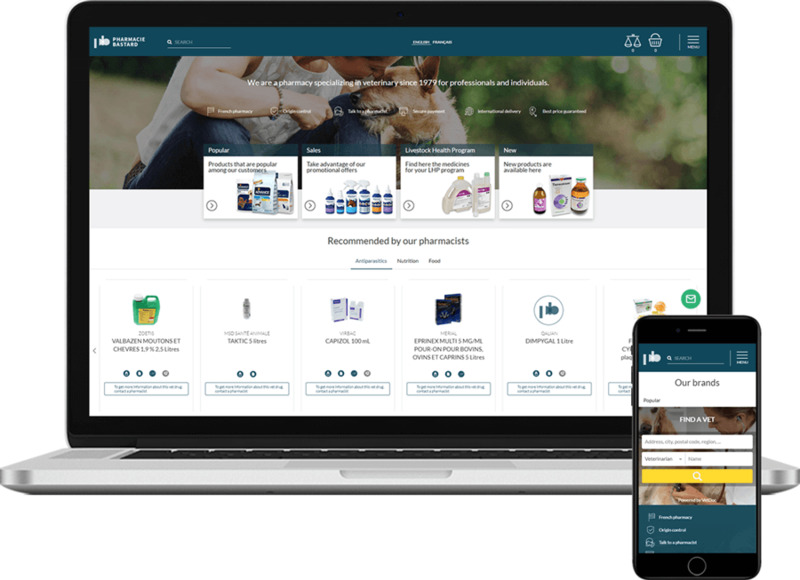 For the online stores we implemented wide searching capabilities, including intuitive live search with results separated by products/categories/laboratories, customizable type and category specific filters. Oscar ships with pretty good ElasticSearch support, so Elastic handler was used as basic search engine. The search system was designed for maximum performance, preventing unnecessary calls to the production database. In order to stand out among other similar online pharmacies, PharmacieBastard additionally offers Animal health management center. It allows keeping track of animal health related data, like animal profiles (with birth date, ids, weight, symptom and disease history), information on veterinarians, prescription records, drug dispensings, etc. Health management app shares data between multiple websites so that user can arrange and store all information in one place. Among the payment options there are PayPal and Paybox. Oscar comes with a package for integration of both PayPal Express and PayPal Payflow Pro. If customer wants to use PayPal account for purchase, they will be redirected to PayPal’s website to confirm shipping address and payment. Then customer is redirected back to the online shop to confirm the order. Shipping addresses are stored automatically and can be used later. Paybox was used as a technical solution to power e-transactions with bank of client’s choice. Paybox is a multi-bank and multi-channel payment service provider present on the e-commerce market since 1991. This platform offers a true virtual electronic payment terminal aimed at accepting online payments. Paybox headquarters is situated in France and is totally “multi-bank” solution there, but this platform works across over 40 European countries and offers cooperation with a great number of European acquirers. Paybox offers a rich set of features including complex processing on e-commerce sites, anti-fraud tools, back-office, and additional payment methods. This payment platform holds accreditation and certification from Visa, MasterCard, and GIE Cartes Bancaires, as well as from non-bank issuers and acquirers. Our team developed back-office with extended functionality. Particularly, we integrated tool for competitor price tracking - Prisync. This service offers easy-to-understand dashboard, reports, e-mail alerts, and comprehensive API with all Prisync data. Since client wanted to track and compare competitor’s prices, we developed a working Prisync API wrapper for fetching different product price data on various domains and displaying this data in the back-office. Watermarks for images uploaded to the website. Using Django Oscar as an e-commerce framework for this project proved to be a right choice. It revealed itself as a reliable and customizable tool for complex business needs. In close collaboration with client we were able to outline project development plan and its most important features. The implemented solution delivered maximum business value and covered all client’s objectives: website architecture is intuitive and logical, store management is seamless and user-friendly. Online store offers human and veterinary pharmaceutical products online for low prices as well as professional consultation. This ecommerce shop specializes in veterinary drugs, food and nutrition supplements. This store 's supply includes medicine, food and nutrition supplements for your cattle. Want to develop an e-commerce solution?